The failure on the part of establishment media to defend Julian Assange, who has been trapped in the Ecuadorean Embassy in London since 2012, has been denied communication with the outside world since March and appears to be facing imminent expulsion and arrest, is astonishing. The extradition of the publisher -- the maniacal goal of the U.S. government -- would set a legal precedent that would criminalize any journalistic oversight or investigation of the corporate state. It would turn leaks and whistleblowing into treason. It would shroud in total secrecy the actions of the ruling global elites. If Assange is extradited to the United States and sentenced, The New York Times, The Washington Post and every other media organization, no matter how tepid their coverage of the corporate state, would be subject to the same draconian censorship. Under the precedent set, Donald Trump's Supreme Court would enthusiastically uphold the arrest and imprisonment of any publisher, editor or reporter in the name of national security. There are growing signs that the Ecuadorean government of Lenn Moreno is preparing to evict Assange and turn him over to British police. Moreno and his foreign minister, Jose' Valencia, have confirmed they are in negotiations with the British government to "resolve" the fate of Assange. Moreno, who will visit Britain in a few weeks, calls Assange an "inherited problem" and "a stone in the shoe" and has referred to him as a "hacker." It appears that under a Moreno government Assange is no longer welcome in Ecuador. His only hope now is safe passage to his native Australia or another country willing to give him asylum. Moreno's predecessor as president, Rafael Correa, who granted Assange asylum in the embassy and made him an Ecuadorean citizen last year, warned that Assange's "days were numbered." He charged that Moreno -- who cut off Assange's communications the day after Moreno welcomed a delegation from the U.S. Southern Command -- would "throw him out of the embassy at the first pressure from the United States." The persecution of Assange is part of a broad assault against anti-capitalist and anti-imperialist news organizations. The ruling elites, who refuse to accept responsibility for profound social inequality or the crimes of empire, have no ideological veneer left to justify their greed, ineptitude and pillage. Global capitalism and its ideological justification, neoliberalism, are discredited as forces for democracy and the equitable distribution of wealth. The corporate-controlled economic and political system is as hated by right-wing populists as it is by the rest of the population. This makes the critics of corporatism and imperialism -- journalists, writers, dissidents and intellectuals already pushed to the margins of the media landscape -- dangerous and it makes them prime targets. Assange is at the top of the list. The ruling elites no longer have a counter-argument to their critics. They have resorted to cruder forms of control. These include censorship, slander and character assassination (which in the case of Assange has sadly been successful), blacklisting, financial strangulation, intimidation, imprisonment under the Espionage Act and branding critics and dissidents as agents of a foreign power and purveyors of fake news. The corporate media amplifies these charges, which have no credibility but which become part of the common vernacular through constant repetition. The blacklisting, imprisonment and deportation of tens of thousands of people of conscience during the Red Scares of the 1920s and 1950s are back with a vengeance. It is a New McCarthyism. Did Russia attempt to influence the election? Undoubtedly. This is what governments do. The United States interfered in 81 elections between 1945 and 2000, according to professor Dov Levin of Carnegie Mellon University. His statistics do not include the numerous coups we orchestrated in countries such as Greece, Iran, Guatemala and Chile or the disastrous Bay of Pigs invasion in Cuba. We indirectly bankrolled the re-election campaign of Russia's buffoonish Boris Yeltsin to the tune of $2.5 billion. But did Russia, as the Democratic Party establishment claims, swing the election to Trump? No. Trump is not Vladimir Putin's puppet. He is part of the wave of right-wing populists, from Nigel Farage and Boris Johnson in Britain to Viktor Orba'n in Hungary, who have harnessed the rage and frustration born of an economic and political system dominated by global capitalism and under which the rights and aspirations of working men and women do not matter. Demagogues like Trump, Farage and Johnson, of course, have no intention of altering the system of corporate pillage. Rather, they accelerate the pillage, which is what happened with the passage of the massive U.S. tax cut for corporations. They divert the public's anger toward demonized groups such as Muslims, undocumented workers, people of color, liberals, intellectuals, artists, feminists, the LGBT community and the press. The demonized are blamed for the social and economic dysfunction, much as Jews were falsely blamed for Germany's defeat in World War I and the economic collapse that followed. 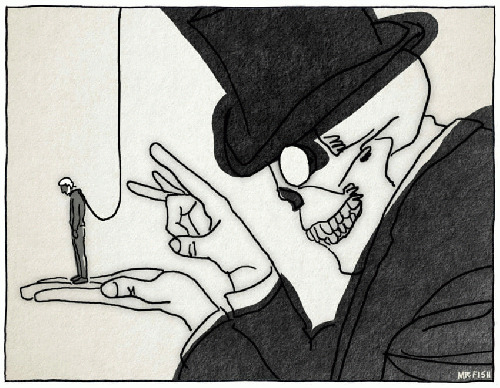 Corporations such as Goldman Sachs, in the midst of the decay, continue to make a financial killing.